Summer is a time for relaxation, sunshine and fun. Everyone in America knows that a staple part of summer is Independence Day, aka the Fourth of July. Most people plan their biggest shenanigans around this time of year; nothing says summer like an Independence Day celebration. We all know the mainstream facts of the fourth; flags, fireworks and a lot of food. But one of the most pressing questions is; where should you partake in these activities? So whether you’re a family man, party girl, or hopeless romantic we got you covered with some great ideas on places that fit into any category worthy of your Fourth of July celebration. Are you into nature or getting wild in the woods? If so the perfect idea for your Fourth of July celebration is to go camping. You can camp any way really; buy a tent, use a pop up or even just build a lean-to to sleep in. Either way camping can work on a low budget by just bringing some sleeping pads, lighter fluid, sparklers and hot dogs. But if you’ve got some money to blow and consider yourself the extravagant type there are a lot of great campgrounds around with plenty of things to do including kayaking, live music, fireworks and more. Camping’s great for leaving civilization for a while and just spending time with the people you want to see. The best part about camping is you can invite as many or as little people as you want. Bring the family, have fireworks and grill, bring your partner on a hike to romantically watch the sunset, or invite everyone you know (preferably set up camp in a field) and have a festival of a celebration! Here are some great New England trails and campgrounds that are perfect setting for your celebration! One of the most leisurely places to have a great time is in your back yard. Have a cookout, buy some fireworks, play some music and have a lot of fun. Invite over the neighbors and have a big bash to celebrate on your street. Don’t forget that one has a lot of room for activities in the back yard. Try having a pig roast, or bonfire, set up the volleyball net, horseshoes, or a dance floor. And of course don’t forget the Pool Party! Haven’t got a pool? Find out what kind of pool will fit into your back yard and budget, or just to see if your current pool is the best option for your back yard. After all nothing says summer celebration like partying in your own back yard. Another great way to have some fun on the fourth is to go to your local fireworks show. It’s beautiful, fun and usually free or very inexpensive. It’s always kid friendly and a great way to see what’s going on with the people in your community. Information about your local firework show can be found in many places, check out the news, look online or request an information packet from the town clerk’s office/ a community information booth. Usually posters are posted around the community advertising the event. One never fail option for fun is to go to the beach, a great way to spend a sunny Fourth of July. Stay late and build a fire, cook some s’mores and hot dogs, it’s a perfect solution to any uneventful day. Boating is always a great idea to pass the time, tubing, waterskiing and wakeboarding always ensure a good time. Some lakes allow you to rent a kayak or canoe for the day. 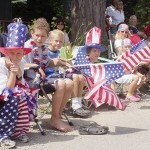 Every town has an annual July Fourth parade; it’s usually free, and lasts a good two hours. A great way to get some free candy for the kids and to get into the spirit of Independence Day! So that’s just a few options, you can always search music festivals, and other public celebrations going on in your area to assist you in discovering the perfect place to spend your Fourth of July.